When I posted my Lodo dress I mentioned that I had no plans other than one dress to make specifically for maternity wear. Today I’m sharing that one dress with you! Thankfully, this dress will still be wearable post-pregnancy making this a great addition to my handmade wardrobe. This is my fourth (!) Fringe dress to sew, but only the third one for myself. You can see each version here, here and here. When I found out I was pregnant, I remembered Alina’s maternity-friendly Fringe and knew that I wanted to use the Fringe to make a dress for one of my baby showers. Then it was a matter of finding the perfect fabric, which I found at Finch Fabrics back in January. They were so helpful in confirming that the lace and solid rayon I had chosen would indeed work well together! I did not make any adjustments to the front length of the dress to accommodate my bump and to make sure it was the same length all around. I don’t mind it being a bit shorter in the front while I’m pregnant. This also makes it to where I don’t have to make any adjustments to the dress after baby R gets here! This was THE perfect dress to wear to one of my beautiful baby showers as well as for some of our maternity pictures. 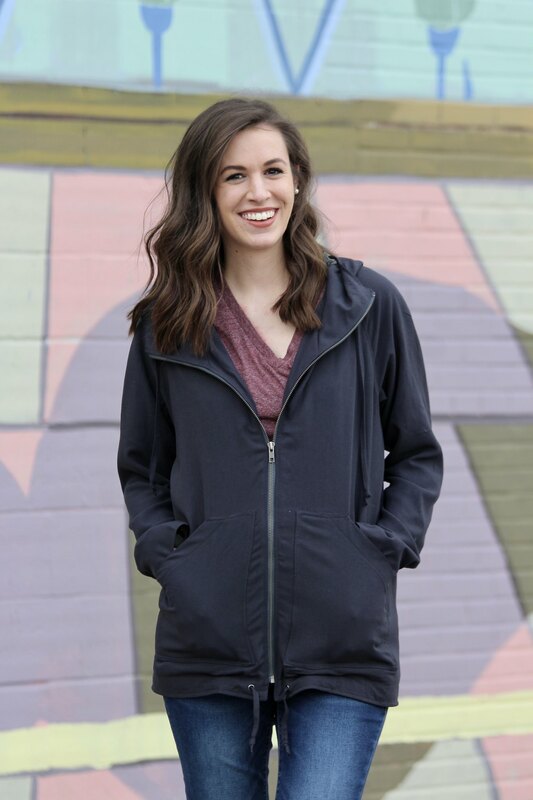 It’s comfortable, lightweight and easy to wear! While I’ve sworn off doing specific “maternity sewing” I am glad I took the time to make this piece for such a special time! What a beautiful dress for a special time. And how special to have nice pictures of both! I was never much interested in maternity photos, but now I realize that as the photographer in the family, that means there are almost no pictures of me pregnant (and I have 4 kids, so there’s been ample opportunity! ).